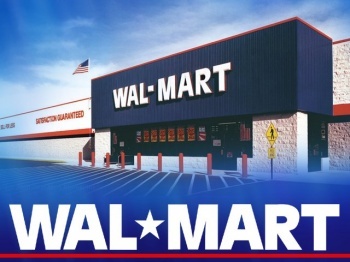 The world's largest retail chain has joined forces with Gaikai to offer streaming PC titles through Walmart.com. Say you're at home. You're bored. You need something new to play. You'd like to pick up the latest shooter, but that would involve finding pants, driving to the store, and missing the last ten minutes of Mansquito. Luckily, Walmart has the answer. The retail giant has inked a deal with Gaikai to bring the latter's "open cloud gaming platform" to the website of the former. Translation: Gamers, even those with low-end PCs, will be able to stream playable titles directly from the retailer's site. With streamed games, the actual game runs in Gaikai's servers in the internet cloud, or web-connected data centers. Changes to the game are executed on the servers and then sent over broadband connections to a user's computer. That way, it isn't necessary to do any computing on the user's machine, except displaying the images on the screen. The heavy-duty processing is done by the servers. That allows users to play games on web sites and use hardware that wouldn't ordinarily be able to run game as a client-based title. The idea, it seems, is to compete directly with OnLive, the popular streaming games service whose name has become synonymous with the cloud gaming concept since its debut in June of 2010. Key to the new Gaikai deal, is the company's ability to stream game demos directly to customers. A survey of 20,000 gamers showed that being able to try a game before purchasing it was the most crucial impetus in securing that sale, claims Gaikai CEO (and Earthworm Jim creator) Dave Perry. Walmart realized that gamers don't have the patience to download 1GB-plus demos just to test a game, so by uniting with Gaikai, the company hopes to offer prospective customers a chance to test drive new games whenever the impulse strikes. If your interest is suddenly piqued, you can experience the fruits of corporate symmetry at Walmart.com's new Game Center site. Despite my personal bias toward the Walmart brand -- Walmart : native Portlanders :: Dracula : Grant Danasty -- this is just the sort of bold move the retailer needs to further assert its dominance over the global games industry. The company is already ubiquitous enough to demand (and, largely, receive) content changes in games, and snapping up a share of the nascent cloud gaming market can only make it more powerful.